Need a dash of challenge for one employee and a sprinkle of incentive for another? A formal succession plan can be a recipe for professional advancement. Let’s say you win the lottery today and, excited about your unexpected good fortune, resign your position tomorrow. What’s the likelihood your institution will have one or two current employees that you’ve seasoned to be ready and able to step into your hard-to-fill shoes? Pretty low, suggests Patrick Sanaghan, president of The Sanaghan Group, an organizational consulting firm based in Doylestown, Pa. “I’ve been on a lot of board retreats where the leaders talk about the issue,” he says, “but it’s rare to find a campus with a formal succession planning model, complete with an org chart and list of people. In fact, when Warzynski was director of organizational development at Cornell University, Ithaca, N.Y., six years ago, he estimated the university could save about $2 million on searches annually by instituting succession planning. In addition to saving money, says Warzynski, developing a professional bench of diverse internal talent, based on predetermined ingredients, ensures business continuity by providing backup support and provides incentives for individual employees to grow through professional development opportunities. “To increase staff productivity while decreasing costs, you have to challenge, develop, and empower people—and succession planning does all of those things,” Warzynski believes. From personal experience, Melissa Trotta knows what can happen on a campus with limited talent development initiatives. Now associate dean for executive education and strategic initiatives at the Johns Hopkins University School of Advanced International Studies, Washington, D.C., Trotta often saw high-potential co-workers at other institutions walk out the door when they did not see viable career paths internally. Stories like Trotta’s can have happier endings both for individuals and the institutions that employ them. To retain your own talent—especially the people specifically recruited for their ability to perform at a high level—lay the foundation for solid succession planning and staff seasoning with these steps. Engage in workforce planning. Narrowly defined, succession planning focuses on identifying and preparing current employees to eventually move into a handful of key, mission-critical leadership positions, such as CFO and CIO. Both Warzynski and Sanaghan recommend a more comprehensive approach, one that aims to develop leaders at all levels. “You can create a pipeline to develop talent for key positions while also offering opportunities for growth to other interested employees. A career planning program linked to succession can be a way of covering the entire organization,” says Warzynski. For Mark Coldren, associate vice president of human resources at Ithaca College, Ithaca, N.Y., succession planning starts with identifying key leadership competencies, no matter what the position. Although Ithaca does not yet have a succession plan, it is moving in that direction by first building solid staffing plans for the future. “Be pragmatic about your core competencies, being careful that they don’t turn into an exhaustive list,” Coldren advises. Characteristics might include such attributes as strategic thinking, ability to manage, business knowledge, and valuing diversity. Next, he says, “You look at the individual positions. For the chief business officer, for example, what other financial or strategic competencies would you add?” In 2013, Ithaca followed the competency exercise with a workforce plan—looking at the talents and skills within the entire organization as it currently exists and considering what positions and competencies will be needed in the next few years to fulfill the institution’s strategic objectives. “Every hire we make has to be strategic, rather than taking someone just to fill the slot,” concurs Mary Lou Merkt, vice president of finance and administration at Furman University in Greenville, S.C. (see sidebar, “Grooming Possible Successors”). Identify and assess potential leaders. Merkt encourages her group’s managers to think carefully about every position and how they would fill it should a sudden vacancy occur. Who, for example, acts in a leadership role even if not currently in a position of responsibility? “When you have that discussion as a group, it’s pretty easy to see right away that you might have great leadership possibilities in IT, for example, but not in finance—or vice versa,” she says. Based on existing attributes, assessments of current and potential skills, and other performance indicators, you can identify ways each employee can maximize his or her potential within your institution. According to Sanaghan, those who bubble to the top as future leaders—known in the corporate sector as “high potentials”—usually represent the top 5 percent of employees. They require specialized attention, including a plan for developing their readiness skills to move up, through, or across the organization as needed. When you select the people with the highest potential to succeed campus leaders in the future, Sanaghan offers two points of caution. First, he says, make sure you don’t fall into the trap of “comfortable cloning”—choosing people who are just like you in terms of race, gender, personality, areas of strength, and so forth. “Also, remember the ‘stylistic invisibles’—the quiet, thoughtful, and maybe introverted people who have the competencies to do a job well but are often overlooked in favor of more charismatic, articulate extroverts. Those quiet and shy people need to be developed, too,” says Sanaghan. If you don’t currently have anyone on your staff to train or mentor into readiness for a future position, have a plan in place for external hiring. “You have to be prepared to start a search quickly, which means keeping the position description up-to-date, knowing which search firms you’d consider using, and knowing when and where you’ll advertise,” says Merkt. In a succession plan, she advocates including a list of outsourcing solutions, such as firms specializing in interim placements. 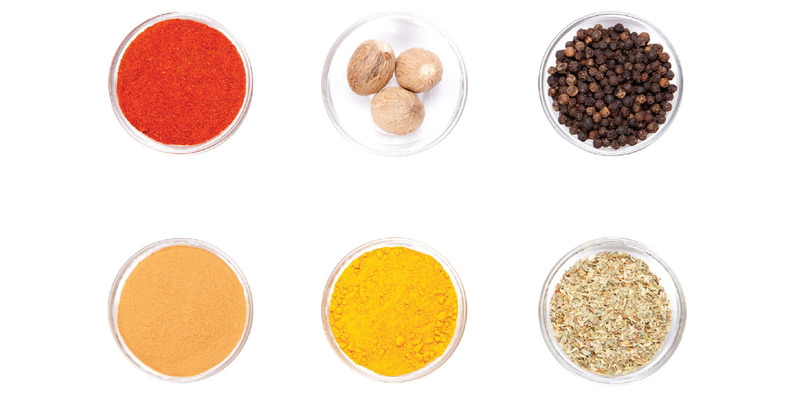 Provide a rich menu of development opportunities—and the rationale behind them. As executive director for university organizational and professional development at Virginia Tech, Blacksburg, Va., Lori Baker-Lloyd oversees the university’s Executive Development Institute (EDI) and Management Academy. The former identifies and grooms high-potential senior leaders for the university, while the latter focuses on developing future leaders (middle to upper-middle managers). For both annual leadership programs, vice presidents and deans make the nominations; Baker-Lloyd’s unit works with a senior management committee to select the participants; and the president’s office provides the funds. The nominating unit, however, is expected to provide funding and support for additional development opportunities. Since EDI’s introduction in 2008, 121 employees have completed the seven-month program. Of those out of the program more than a year, almost 40 percent have been promoted or taken on expanded responsibilities; only 11 percent have left the university, primarily for personal rather than professional reasons. Baker-Lloyd keeps EDI alumni active and visible by (1) circulating their names when senior leaders form task forces, and (2) asking them to mentor Management Academy participants. Having researched internal leadership programs within higher education for her dissertation, Melissa Trotta underscores the need for such communication. When interviewing alumni of leadership programs, for example, she discovered some had no idea why they had been nominated to participate. Others thought the program was remedial and meant to address a performance shortcoming rather than expand learning opportunities. Chet Warzynski encourages colleges and universities to expand beyond formal leadership programs, perhaps borrowing ideas from the corporate sector. Large companies, for example, typically offer job rotation, job shadowing, mentoring, and on-the-job stretch assignments, in addition to classroom training, experiential learning programs, and executive centers that assess and develop potential. Keep your plans and programs fresh. “Succession plans and competency models need to be live documents, not something you never edit or revise,” believes Baker-Lloyd. That’s why Virginia Tech plans to revisit the competency model it created six years ago and use it as a foundation for its Executive Development Institute curriculum. Warzynski notes that the workforce within higher education currently includes four generations, with more than 20 percent of employees at most institutions now eligible for retirement. Given those demographics, Warzynski suggests adapting your succession plan to welcome not only diversity but also to recognize and respond to the different leadership and learning styles of multiple generations. Some names on the succession planning list may need to change as well, as newer and younger employees take advantage of development opportunities to increase their visibility and make their mark on the organization. She also would like to introduce “stay interviews” at Virginia Tech, as one means for managers to communicate the plans they have in mind for those exhibiting high leadership potential. Baker-Lloyd saw the benefits at her previous organization, which required its senior leadership team to regularly conduct stay interviews with the people the group identified as key talent, with the hope of averting exit interviews in the future. Rather than simply telling an employee, “You’re on a succession planning list,” and walking away, the leader remains responsible for managing and developing that talent. “The senior leadership team uses the stay interviews to identify upcoming professional development opportunities, review previous opportunities, discuss what the group has in mind for stretch assignments, and converse about the person’s value to the organization,” Baker-Lloyd says. In some institutions, the president’s office maintains a written—and confidential—list of people considered the prime internal candidates for key leadership positions. While such a list isn’t a required component of succession planning, the demonstrated commitment from top leadership certainly is. Without the ongoing support of senior leadership—appointing potential leaders to special project teams, sharing their expertise with up-and-coming employees, and talking about careers on campus—succession planning will have little chance of taking root. Plus, administrative funding is often needed to undertake formalized development activities and programs. Because succession planning overlaps with leadership development, career planning, and performance management, you’ll also need HR support to help integrate those various elements. Using a talent management database or module, for example, HR personnel can easily track an individual’s competencies, skills, assessment results, and growth experiences and link that information to a personal development plan. “Ideally, the HR person should look at all performance reviews and identify those with the highest ratings. Then the HR person and the manager need to have some conversations about how to get that high-performing employee ready to take the next step,” says Mark Coldren. With many baby boomers positioned to retire within the next five to 10 years, such conversations are crucial for shaping the next generation of leaders. Less-experienced leaders will need the time to develop a skill set for the future—one that may look different in terms of the talents and competencies valued in their institutions today. In other words, all should be well. So, go ahead and buy that lottery ticket. SANDRA R. SABO, Mendota Heights, Minn., covers higher education business issues for Business Officer. Furman University’s Mary Lou Merkt encourages her group’s managers to think carefully about every position and how they would fill it should a sudden vacancy occur. Because succession planning overlaps with leadership development, career planning, and performance management, you’ll also need HR support to help integrate those various elements. When the day comes for Mary Lou Merkt to stop working at Furman University, she believes it is her responsibility to leave behind colleagues who could take her place. “It’s up to me to mentor these folks and present them in the best light to the president and the trustees,” says Merkt. As Furman’s vice president for finance and administration, Merkt counsels those on her staff interested in moving up to hone management skills, complete master’s degrees, and become active in the regional association of college and university business officers. She assigns broader responsibilities to colleagues with the needed skills and the desire to advance within the organization; she views cross-training as another important aspect of leadership development. JANET LINDNER, associate vice president for administration, Yale University, New Haven, Conn., and JANET CASTRICUM, vice president, organizational consulting, Right Management Consultants, Stamford, Conn. The State University of New York (SUNY) recently launched a pilot program to develop a competency-based succession planning process for its 64 institutions, including research universities, community colleges, and academic medical centers. Through the pilot program, SUNY will develop, test, and refine a system to ensure that it continues to attract, develop, retain, and place employees in positions where they will have the greatest impact onthe system’s strategic mission and plan. And the pressure is on, as SUNY estimates that 44 percent of its staff—or more than 26,000 people—will become eligible for retirement within the next five to 10 years. 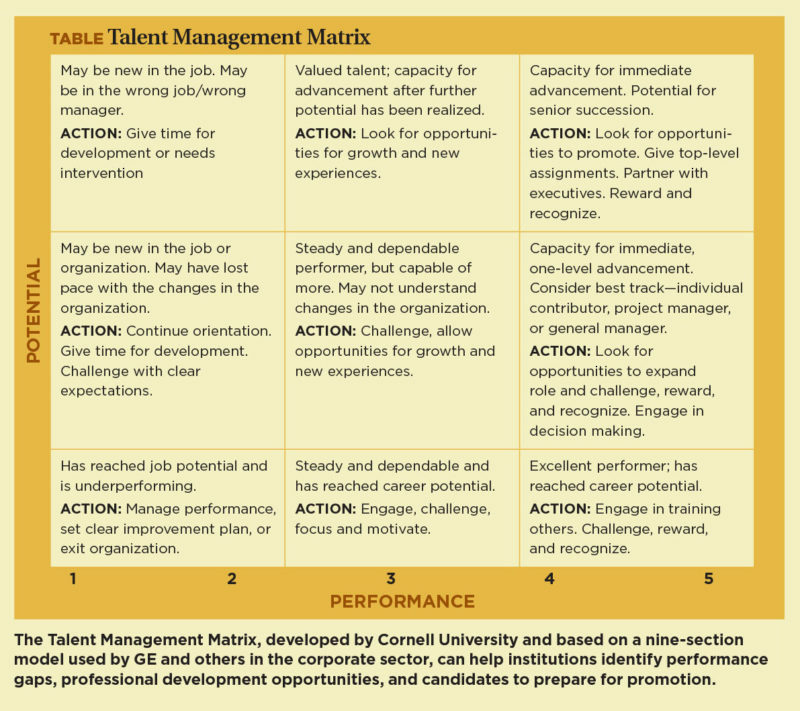 One tool Warzynski finds useful is a talent management matrix (see table), which helps managers and senior leaders to assess other would-be leaders by comparing current performance with future potential—and taking appropriate actions as noted in the table. The top right corner of the matrix will apply to your best performers with the most potential—those whom the institution would do well to further train and motivate. SUNY’s pilot program will focus on answering eight key questions, which other institutions might find helpful in developing or revising their own succession planning process. What are the characteristics and components of an effective competency-based succession management system? What are the key positions at our institution to include within a succession planning process? What criteria or competencies should we use for selecting high-potential leaders for key mid- and senior-level positions? What best practices are used by top corporations and universities in competency-based succession management? How would line managers identify, develop, and select people for succession to key positions? How would senior leaders hold managers accountable for identifying, developing, and advancing high-potential leaders to replace people in key positions? How will the institution know when its competency-based succession management process is successful? What metrics would be used to evaluate and determine success? What are the barriers and obstacles to implementing a succession planning process at the institutional level [and at the system level]? How would they be resolved? Over the past few years, the University of California, Davis (UC Davis),took a hard look at the demographics of its workforce by job groups. Based on years of service, age, and other data, the university determined that chief administrative/academic officer positions posed the biggest risk for retirements within the upcoming five years. About the same time, the University of California System conducted a staff engagement survey. The results revealed that employees had a high interest in receiving more support from supervisors and managers and wanted to better understand the opportunities for career development and progression within the organization. “When we coupled the survey results with the highest-risk positions for exits, and looked at the internal feeder pool, two programs came out of it,” says Susan Gilbert, associate vice chancellor, human resources, at UC Davis. Administrative Officers for the Future. This program, launched in 2013, is intended to build bench strength. Based on the competency model UC Davis developed for chief administrative officers, the seven-month program blends classroom instruction with e-learning, assessments, writing assignments, team projects, and individual development planning. It culminates in group project presentations, which are critiqued by a cabinet of UC Davis leaders. Managers and supervisors initiative. Based on the data analysis, the university now asks management to initiate a professional development discussion during each employee’s annual performance evaluation. It’s a deliberate attempt to allow managers to better understand their employees’ career goals, and then provide them with development experiences or refer them to a career counselor dedicated to serving UC Davis employees. For example, she says, UC Davis had not placed a lot of programmatic emphasis on internal career progression. University employees have commented that external candidates are being hired for many high-level positions. Consequently, staff are seeking ways to develop their own skills to be competitive candidates for those jobs.